The Edison Eagles lost their first five games last season and were thought to be a year away from again becoming serious regional and state contenders. So much for that idea. The Eagles went on to win yet another district crown and also the 5A region, only losing a handful more games the rest of the way. With everyone back from last year there’s no reason to believe Dianne Lewis’ squad won’t be even better this season. 6’0″ junior wing Carole Miller is the player teams have to be concerned with most when playing the Eagles. She’s extremely athletic and can get up and down the floor with ease, also protecting and attacking the rim as she sees fit. As her shooting continues to progress she has the potential to be one of the state’s best players. Sophomore guards Bri Johns and Charlotte Jewell are capable of scoring in double figures on any given night, as are senior forward Tamrin Henderson and senior guard Amaya Gray. Sophomore guards (there’s more!) CiCi Harris and Kaitlyn Lee are also perfectly comfortable in the rotation, and often-overlooked senior swingman Kai Lee is very capable performing in big games. There’s a ton of depth. As long as the Eagles become better free throw shooters and keep Miller and Henderson healthy to pound the glass Edison will be one of the region’s best teams. If you take bad shots against them they’re liable to destroy you in transition and when they’re especially focused on defense, look out. The Marshall Statesmen split with Edison last year in two very close games and have the potential to outlast Edison for the district crown. While there’s talent throughout the roster, it all starts with 6’4″ Clara Ford in the middle. Ultra-athletic and relentless, she can dominate games in the middle like no other Northern Virginia public school player can. 20 points and 10 rebounds are a given for her on most nights–almost a bad night at this point. She’s got a good backup in sophomore Rachael South as well. Coach Mike Trivisonno has the option of bringing South off the bench or going big with her alongside Ford. Marshall wasn’t a particularly good three-point shooting team last year; if the Statesmen can open up Ford’s game by draining more this time around their offense will be extremely hard to stop. Enter Coach Trivisonno’s daughters, Mary and Christina. As freshmen they will start immediately, and while they will are invaluable for their basketball IQ, defense and ball-handling ability, if they can support Ford significantly with shooting the Statesmen will be way better off. Four other returnees bring experience and will receive substantial playing time. Significant steps up in production from the likes of junior guards Grace Grill and Peyton Emory would be icing on the cake. The Thomas Jefferson Colonials beat good teams like Centreville and Marshall last year and almost upset Tuscarora on the road in the second round of 5A regionals. They lose two solid starters, but return a considerable amount of talent. Brodnik is an athletic junior six-footer who can rebound and score, while the junior Wilson will function as the team’s point guard. Sophomore guard Abby Kim also returns after being thrust into the mix last year. She has improved and will have to handle a greater scoring load. 5’10” junior swingman Sami Kale slides into a starter’s role after being a versatile sixth man for much of last year. The Colonials remain young and still don’t have a ton of depth. But they are well-coached, smart, and able to often dictate the pace of the game to their liking. Barring injuries, it is once again extremely likely TJ will be a tough out come February. Coach Marcia Richardson’s Wakefield Warriors lose a lot from last year’s team that fell to Edison in both the district and regional title games. Three of the five seniors lost are playing basketball at the next level, and Summer Matlack’s departure will especially be felt at the guard position. Still, the Warriors retain talent and especially some size to bother opponents. 5’10” senior forward Jamilex Tham-Morrobel (7.5 ppg) now becomes the go-to scorer, and the frontcourt is deep with 6’0″ junior Hannah Foley, 6’1″ sophomore Jayela Lopez, and 5’10” junior Lauryn Freeman. All need and will receive a lot more court time this year as the Warriors seek to control the points in the paint battle night in and night out. The backcourt is more of a question mark with the loss of Matlack. Sophomore Makyla Loeffel is a talented multi-sport athlete that has to step up. If she does and others from last year’s JV can contribute significantly, Wakefield could find itself contending again quicker than some expect. The Falls Church Jaguars may not be a regional contender, but they’re going to be a very solid team that is capable of finishing at least third in the National District. All of their top five scorers return, led by junior guard Sierra Kennard (12.9 ppg). They’re still fairly young, but have a very strong senior core with forward Leah Shaw plus guards Rasha Benhamida and Mia Pendleton. It smells to us like a mix of youth and experience that might pay off when it counts most. The Jags only won eight games last year but will do much better than that this season. Coach Le Towe takes over at Lee this year, and optimism runs high at Lancer Nation. Le Towe is the new coach of the Lee Lancers, and it was hard not to get a sense of optimism when we visited the gym and took in their first scrimmage against Champe. The girls played hard, the first step toward building a program in a place where that hasn’t been easy in recent years. Moreover, they battled back after going down significantly early to score more total points than the Knights. Lee isn’t going to contend overnight, but it would be a fatal, fatal mistake for opponents to think the Lancers are devoid of talent. Towe has three impressive sophomore building blocks to build upon. 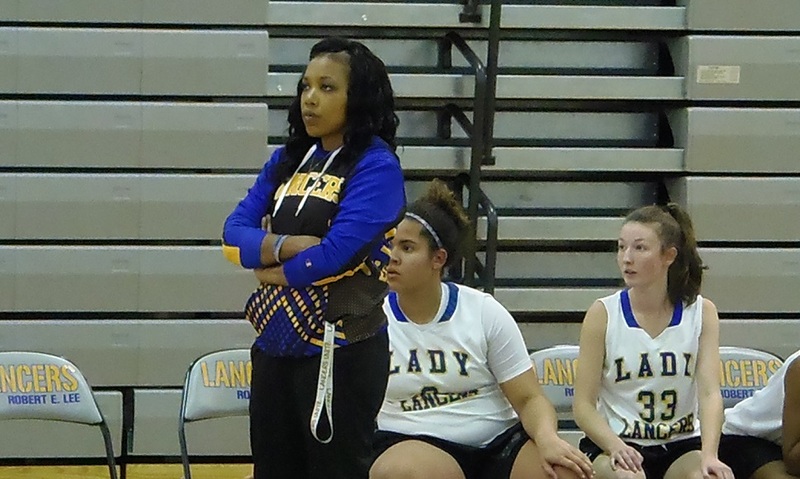 Guard Vanessa Gardiner is a smart player who can run the show and score in bunches. 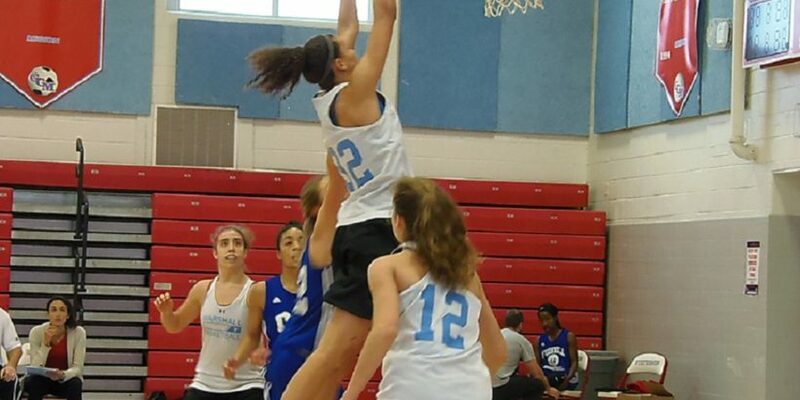 Wing Cierra Blum is fearless attacking the rim. Power forward Osbourn transfer Taven Pulliam is physical and an excellent passer who can score inside and out. If Towe can keep the team working hard the Lancers will score some upsets this year and have a bright future ahead. We believe she will. Finally, the Stuart Raiders finished last in the National last year but will field a better team this year. That’s because coach Brandon Sutphin’s team last year was ridiculously young. Guard Emiko O’Cadiz led the team in scoring last year as a freshman and fellow backcourt mate Luisa Lambo is also still just a sophomore. Senior Mayada Hassan also returns, so most of the Raiders’ top weapons are back. “Our goal is to teach this young team and be competitive every game. We want teams to be scared to play us later in the season,” Sutphin says. It’s still going to be a challenge to see Stuart improve by a ton of wins in the challenging district but it was easy to see the improvement the squad made last year. Despite some injuries this preseason to further test the program’s depth, progress should be steady for yet another team seemingly headed in the right direction.